Jarrett Guarantano passes under pressure for the White team during Tennessee's Orange and White spring football game Saturday at Neyland Stadium in Knoxville. Updated with more information at 12:30 a.m. on April 14, 2019. White team tight end Dominick Wood-Anderson prepares to pull in a pass during the Orange and White spring football game Saturday night at Neyland Stadium. 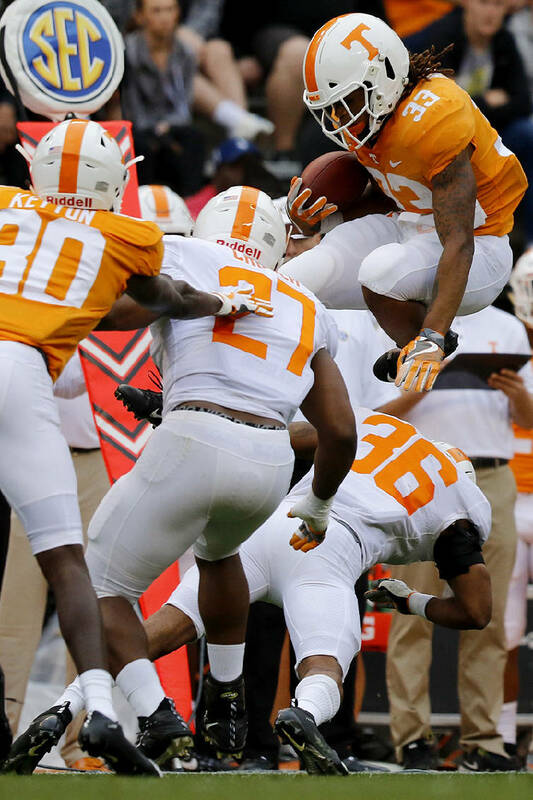 Orange team running back Jeremy Banks (33) jumps over White team defensive back Terrell Bailey (36) during the Orange and White spring football game at Neyland Stadium on Saturday night. 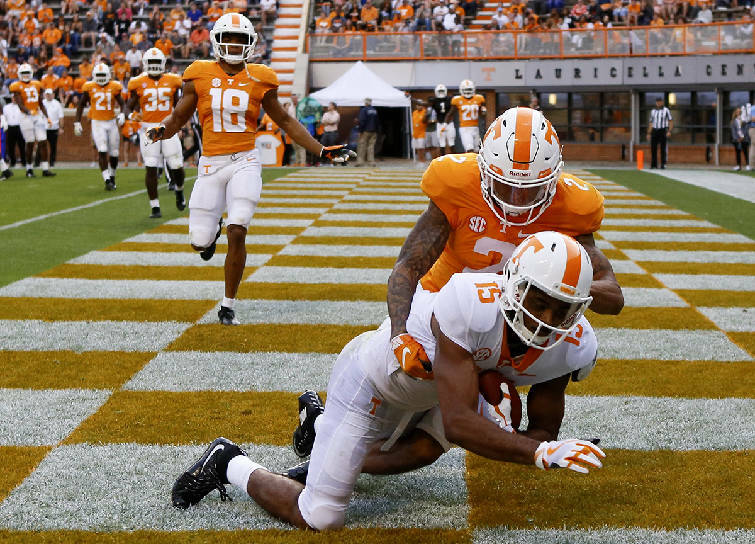 White team wide receiver Jauan Jennings comes down in the end zone for a touchdown catch in front of Orange team defensive back Alontae Taylor during Tennessee's Orange and White spring football game Saturday evening at Neyland Stadium in Knoxville. 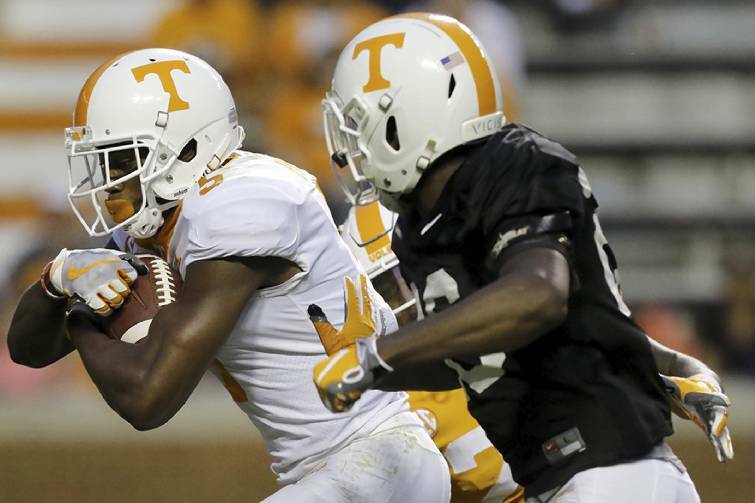 White team wide receiver Josh Palmer runs after making a catch during the Orange and White spring football game at Neyland Stadium on Saturday night. KNOXVILLE — Like an old Apple II computer, Jarrett Guarantano just needed a little while to get booted up Saturday evening. But once he did, both the 6-foot-4, 215-pound Tennessee quarterback and the White (first-team) offense got rolling. 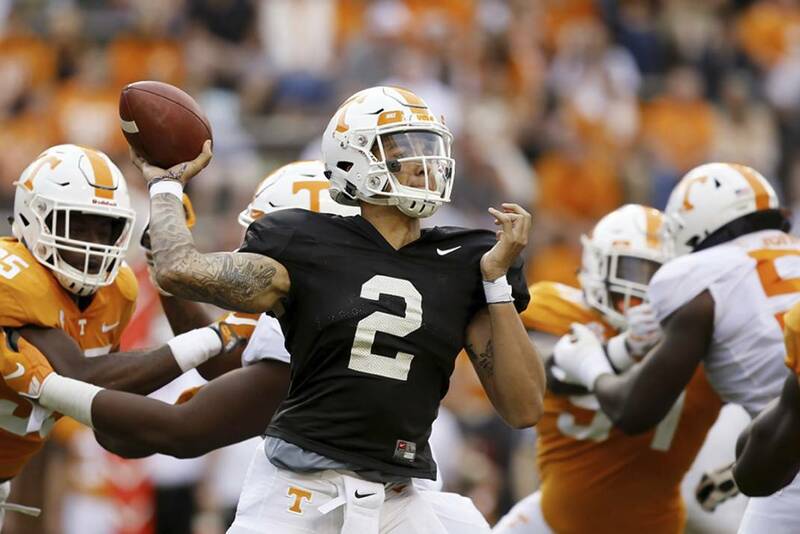 Guarantano was named MVP for the second consecutive spring game with a four-touchdown passing performance, and the White team won 28-10 over the Orange team in front of an announced crowd of 50,967 at Neyland Stadium. Two of his touchdown passes went to Jauan Jennings, with Josh Palmer and tight end Dominick Wood-Anderson catching one each. It was a second-quarter completion for 31 yards to Jennings on a third-down conversion that got the junior quarterback going, as he was 4-for-10 for 21 yards up to that point. 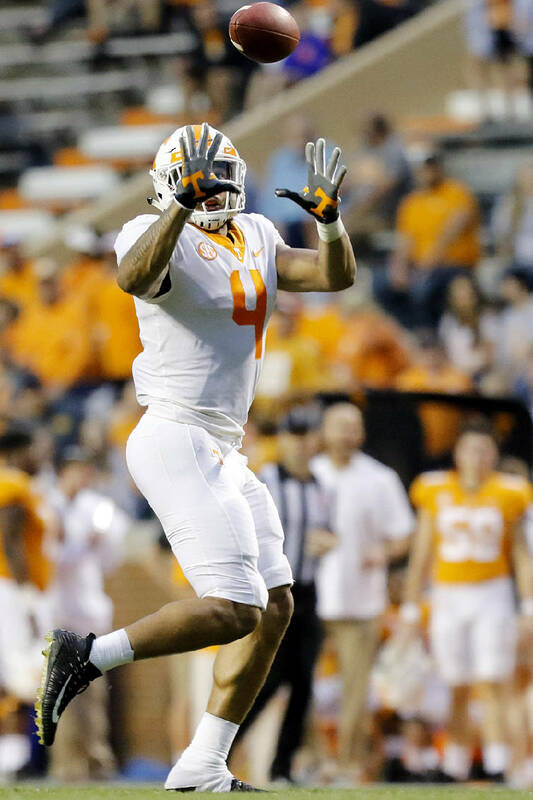 "(Jennings) made a good catch on that good route," Guarantano said. "As soon as we hit that we started to get on pace, get into a rhythm. We started dragging at first — it was probably my fault, I'll take the blame for that — but as soon as we hit that we started to catch on." He finished 19-of-37 for 198 yards but was sacked four times. Jennings was the leading pass-catcher with 57 yards on five receptions, while Marquez Callaway had a team-high 61 yards on two catches, including a 52-yard completion that led to the White team's second touchdown. The Orange (first-team) defense was led by Shanon Reid's 10 total tackles. Three of the Orange's five sacks came from defensive backs with Trevon Flowers, Theo Jackson and Nigel Warrior getting credited with stops behind the line of scrimmage, while outside linebacker Deandre Johnson and defensive lineman Matthew Butler had the others. Tennessee head coach Jeremy Pruitt noted the teams tried to keep things somewhat simple Saturday. "It was really basic today," linebacker Daniel Bituli said. "The coaches just wanted us to go out and play without really thinking a lot." Noted Guarantano: "They've been throwing some crazy stuff at us (in practice)." Replied Bituli: "They got it easy today." Backup quarterbacks Brian Maurer and J.T. Shrout led scoring drives for the Orange offense, with Maurer completing his first five passes on a 12-play, 59-yard drive that ate up 6:50 and ended in a 20-yard Paxton Brooks field goal for the game's first points. Shrout led a seven-play, 65-yard drive on the Orange team's final possession, hitting tight end James Brown for a score. Shrout finished 10-of-19 for 138 yards and a touchdown but was sacked three times. Maurer completed seven of his 10 passes for 105 yards but threw a pair of interceptions, both to fellow early enrollee Jaylen McCullough. Tight end Jackson Lowe, another early enrollee, was the Orange team's leader in receiving yards with 60, but his long play of 35 yards ended in a fumble that was both forced and recovered by safety Brandon Davis. After the game, Bituli and Palmer were named the most improved players on the team from the spring. Palmer finished Saturday's game with 25 yards on three catches before going down with a lower-body injury in the fourth quarter, while Bituli had three tackles. "We played a lot of guys today, and there's a lot more competition," Pruitt said. "That's the way it's been all spring. We get some guys back that have been injured. We have some guys coming in that signing class and have some good competition this summer. "We need to create depth on both sides of the ball."